Are Bass Guitars Even Suitable For Distortion? Can You Use Electric Guitar Distortion Pedals With A Bass Guitar? What Makes A Good Bass Guitar Distortion Pedal? Bass guitars are generally left in the background. This instrument’s main purpose is to fill the gap between guitars and drums, as well as to maintain rhythm and band cohesion. However, sometimes it is good to spice things up. To do this, some bass players like to add some distortion to their tone. Despite this being counter intuitive for many, it can yield pretty interesting results. Today we are going to show you some of the best dist pedals for bass guitar and talk a bit about how to use this effect. With that said, lets jump right into it. A well articulated pedal that offers plenty of gain to its users. One of the most unique but ultimately impressive distortions on the market. The classic Green Rhino in a compact format with more awesome features. A truly classic tone repackaged and tweaked to work with bass guitars. A proper gain box that is consistent and offers plenty of range. A simple, reliable and robust package with an astonishing amount of range. An affordable, effective choice that offers great sound and plenty of range. Tech 21's RIP Red Ripper represents a very successful take on a niche field that not many like to deal with.This distortion pedal brings rich gain to the world of bass guitars, and the results are outstanding. Despite its colorful design, a somewhat simplistic chassis and a complex control cluster, Red Ripper reveals its true face only when you decide to plug it into your signal chain. The distortion it offers is balanced, thick but very controllable. Thanks to its special voicing circuit, you can dial in a wide variety of different dist sounds. with ease. Overall, it is among the more neutral pedals of its kind, but one that definitely brings a very consistent performance across the board. Among its vast array of different overdrives and distortion pedals, Electro-Harmonix offers the Bass Soul Food. This model has been gaining a lot of attention in the bass guitar community due to its clear sound and well balanced gain. The pedal features a standard format, making it really easy to mount on a pedalboard, while the controls differ from your usual layout. Instead of offering a full EQ, Bass Soul Food features only a Treble knob and a -10dB pad. The fact that there is attenuation available means that you can hook up even some of the most aggressive active electronics to this pedal. 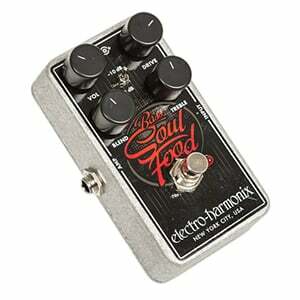 Additionally, the sound you get with Bass Soul Food resembles that of a vintage Klon overdrive. Way Huge and their Green Rhino have been stirring up trouble on the overdrive market for a long time. This line of pedals has got to be one of the most unique and best sounding effects you can get. When it comes to bass guitars, the same applies. Way Huge WHE207 Green Rhino Mini MKIV is one of the latest models from the family, bringing you that classic Green Rhino tone with a bit of a twist. On top of standard controls, MkIV now features a mid and bass control. That means that you can manipulate your low end and mids while shaping the signal with the tone knob. Overall, an interesting setup that has proven to yield great results. Electro-Harmonix Bass Big Muff is a pedal that brings the Big Muff experience to the world of bass guitars. Compared to some other solutions on the market, it is simple, well balanced and packed with a perfect amount of gain. Bass Big Muff comes in that classic EH chassis and features only the most crucial controls. With built in sustain knob, you can use this pedal as a sustain unit as well. This makes it extremely easy to use, but not to a point where you might feel limited. Those who are fans of EH classic dist tone will definitely enjoy the thick sound Bass Big Muff has to offer. Overall, it is an awesome package at a great price. Boss pedals aren't always the most exciting ones you can find, but they are usually among the best. In the world of bass guitar distortion and overdrive, Boss OBD-3 is a beacon of consistency and heavy tone. This pedal features that classic Boss chassis, a decent set of controls and plenty of heat. Tone shaping is done using the built in two-band EQ, while you can also dial in the amount of drive using the balance knob. Compared to some more exotic models out there, Boss OBD-3 delivers a rock solid foundation and a whole lot of range. Whether you are into metal or rock, you'll find that it doesn't get much better than this, especially in this price range. Despite Dunlop taking over MXR, this old brand is long from being extinct. As a matter of fact, they are back on the rise. We can attritbute this trend to successful models and unique solutions. All of this perfectly describes the MXR M85t dist box. It is a compact package that comes loaded with features. In practice, M85 gives you that dirty tone which has defined some of the best music we have had a chance to enjoy. Even though it packs a whole lot of gain, M85 has a much more civilized side. Some like to use it as an impromptu overdrive simple due to how good it sounds. Overall, this is a stealthy model with plenty to offer. Behringer Bass Overdrive BOD 400 represents a very interesting solution. It is a proper bass dist pedal thathas a lot of range inside. However, compared to other pedals of this type, this one costs a mere fraction of the average price. Behringer is known for giving guitar players access to affordable tools that work, which is something they have taken over to the world of bass guitars. BOD 400 packs plenty of gain with a fairly decent set of controls. It's a vanilla dist box, meaning that there are no special features included. If you are on a very tight budget and you need something to spice up your sound, this pedal will take care of you just fine. Surprisingly, the answer is yes. Bass guitars are definitely suitable for distortion, overdrive and all kinds of effects which are usually associated with electric guitars. Whether or not you will use a distorted signal depends on the genre of music you are playing and your own playing style. Bass guitar with a dist pedal isn’t a setup that is necessarily exclusive to metal or rock. Adding this effects to a bass line sounds so unique that many bass players have found a way to incorporate that tone in pop and other genres. Naturally, the playing style of a distorted bass guitar differs a bit from what we consider to be standard. Players who utilize this effect often times push through the mix, sometimes even dominating it. Sometimes a distorted bass guitar is enough to supplement electric guitars give right conditions. At the end of the day it is all situational and depends on what you want to do. If you need a practical example of what a distorted bass can do, just check out Lemmy Kilmister’s work and Motorhead. There is so much you can do, especially if you consider adding other effects to the signal chain as well. This is where many people run into trouble. While some dist pedals work surprisingly well, there is a very good reason why you have bass specific distortion pedals. The main reason is the difference in the frequency range of bass guitars and electric guitars. Former are reaching far deeper into the lower end, while latter are generally higher pitched. Guitar effects manufacturers have to take these frequency ranges into consideration when they design pedals. Some brands are more considerate than others, which is why some distortion pedals work with bass guitars as well. In most cases, Electro-Harmonix Big Muff series are pretty tolerant when it comes to bass use. Same goes for Ibanez Tube Screamers. Only thing you should keep in mind is that finding the right guitar pedal to work with your bass can take some time and experimentation. That is why most bass guitar players who use distortion, generally use bass specific units. Aside from the obvious fact that you are guaranteed decent performance, these pedals tend to have features and controls designed to give you more versatility. Generally speaking, there are a couple of things a distortion pedal needs to offer in order to be considered adequate. The first one is that range that covers the bass frequencies. Without it, you aren’t really left with much to work with. The second most important thing is a blend knob. Having this feature is pretty much essential if you want to get a good tone. We are going to talk about that a bit later in much more detail. Lastly, you will want something that comes with some sort of tone shaping capability. Whether it is a full three-band EQ, a two-band one or just a tone knob, it doesn’t matter. You will quickly find out that being able to dial in those highs, mids and lows matters a lot even if you have an EQ pedal somewhere in the chain. When you first get a dist box for your bass, chances are that your instinct will tell you to just plug it in and lat that gain knob loose. Here’s the thing. This approach may work when you are fronting the band and your bass is in focus. However, if you are still performing the typical role of a bass player, you will have to do much better than that. The main issue with just pumping gain into your signal is getting lost in the mix. Put it this way. You have one or two guitars which are probably distorted. If you are in a metal band, those guitars will most likely be pumped with gain. When you go and do the same, you will just merge in with those guitars and get lost in the mix. Ideally, you want to have raw signal from your bass on one line, while the distorted signal is running through a separate line. Unfortunately, this often times requires specialized gear or two different amps. A more budget friendly solution is to use that blend knob on your pedal. You want to find a point where both your dry and wet signals are in balance. This way, you will retain that trademark thumping tone which will help you stand out in the mix much better. Adding a distortion to your chain is only the first step. Once you have done that and found a good balance of wet and dry tone, you need to figure out which part of your frequency range you want to drive the distortion. Most bass players generally like to keep their distortion centered around mids. If you push that gain all the way down to your lower range, the resulting sound could come out as too fuzzy. On the other hand, pushing distortion on trebles alone won’t get you far either unless you are into heavier genres of metal. In that case, scoop those mids as much as you want. Naturally, your ability to define where your distortion is going to be focused at, will depend on the pedal you are using. This is why we strongly suggest that you get something with a decent EQ built into it. Additionally, adding a compressor can get you some interesting results. Compressed bass distortion tends to be quite abrasive on its own. However, put that into a mix and you will find it to be quite enriching. At the end of the day, your style and preferences are going to be crucial. Every bass player has their own taste, which has a lot of impact on what their tone is going end up sounding like. One of the more popular questions related to distortion pedals has to do with passive and active pickups. The main issue some players have is the fact that their bass could be too hot. In most cases, as in 98% of the time, you won’t have an issue. In case there is a problem with the amount of output you are forcing into the signal, all you have to do is bring the levels down a little and you should be good to go. With passive pickups there shouldn’t be any issues at all. Experimenting with levels is essential no matter what. Not only does this process show you the limits of your bass guitar and your equipment, but it is pretty much the only way to learn how to dial in a proper tone. If you are finding it hard to make your bass work with dist pedals due to high output, some models out there come with attenuation pads. We have listed one such model from Electro-Harmonix. That feature can really help out in such rare scenarios. In essence, as long as you keep the focus on the mids or trebles, you should be fine. Loading a the low end of active pickups with distortion can create a fairly hectic sound. In other words, if you are packing lots of heat, try to keep that gain in your mids. Keep in mind that this isn’t a rule but rather a good starting point. Distortion pedals and bass guitars are not something many associate with one another. Even so, we have been seeing successful examples of this combination for decades. Today, many metal bands are reliant on a decent distorted bass tone. The models we have shown you above are easily some of the best on the market. We’ve tried to mix in models from various price ranges so that everyone could find something that fits their budget. All you have to do is find the right model for your needs. One you do, you will add a whole new dimension to your instrument.